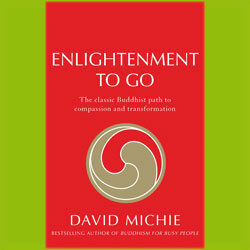 In Enlightenment to Go, David Michie provides a lively and accessible guide to 'the best of' Shantideva. Sharing his enthusiasm for Shantideva's radical insights, life-changing psychological tools and transcendent wisdom, he draws on a wide variety of scientific sources - from mindfulness training to cognitive behaviour therapy, from neuropsychology to quantum physics - to show how Shantideva's Guide is as relevant as ever. Enlightenment to Go also offers a structured meditation program to help readers integrate transformational insights at deeper levels of consciousness where genuine change becomes possible. Recounting stories from his own journey, David Michie illustrates the application of Shantideva's breakthrough teachings to a typically busy Westerner, with warmth and humour. Whether you are a newcomer to Buddhism or a seasoned practitioner, Enlightenment to Go offers a glimpse of a radiantly different reality - and a beautiful illumination of why the Dalai Lama recommends Shantideva's Guide above all other. David Michie is a corporate communications consultant and author of the bestselling Buddhism for Busy People and Hurry Up and Meditate.